No matter what kind of music you make, you owe it to yourself to get this amazing tone-enhancing plugin in your rack. Instantly improves bass guitars, bass synths, kick drums . Also works a treat on vocals, guitars, etc. Kush Audio’s second A-Designs hardware emulation plugin (the first being HammerDSP) is a virtual version of that boutique manufacturer’s legendary bass DI box. The idea of a software DI box might sound absurd, but you could say the same about transformers, and Kush has already proven just how effectively those can be realised in software with the superb Omega series. As you’d expect, REDDI (VST/AU/AAX) is intended to be the first plugin in any chain, with gain staging handled by the Input and Output dials. The Level knob (the only control found on the real REDDI) pushes the input signal ever harder into the distortion circuit, with the output automatically attenuated to compensate for the resulting level increase. As Level is raised, the hybrid tube/transformer combo within (see REDDI or not?) saturates the signal, warming it up and applying the fabulous low-end enhancement and punch for which the real- world REDDI is known and loved. That’s by no means where the story ends, though, as Kush has added a couple of new controls to the plugin that aren’t found on the original hardware, one of which - the pragmatically-named Bass knob - turns out to be the star of the show. Turning Bass clockwise boosts an onboard low shelving EQ, cornering at 100Hz, that works genuine wonders in tightening and emphasising the sub and low frequencies. The Bass shelf is applied prior to distortion, so boosting it doesn’t result in the sort of volume rise you’d expect from a regular EQ, as the tube saturation piles on the compression. Flipping the thoughtfully-added Headroom switch, meanwhile, drops the input signal by 20dB with a compensatory gain boost at the output to bring it back up by the same amount. With Headroom engaged, the distortion becomes much more subtle, giving an alternative style of processing that proves useful for less overt warming treatments. Also, of course, not a feature of the hardware, the Oversampling button can be used to claw back a few CPU cycles if necessary, at the expense of high frequency fidelity and aliasing. As expected, REDDI is particularly at home with bass guitar. Finding the sweet spots for the Level and Bass knobs is never difficult, and the effect is invariably beneficial, focusing the tone, pulling out the best of the bottom end, and getting a grip on transients without choking them. It has a similar propensity for bass synths and kick drums, too. Indeed, despite being a bass DI box first and foremost, the hardware REDDI is known for its versatility, bringing harmonic enhancement to vocals, guitars and just about anything else one might plug into it. 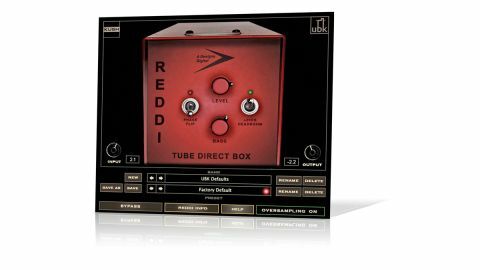 Launched in 2006, Californian manufacturer A-Designs’ REDDI “all tube direct box” fast became a permanent fixture in the stage and studio rigs of countless bass players the world over. A heavy, solid, bright red slab of expensive (£700) audio goodness, it uses a vacuum tube amplifier and Cinemag output transformer to saturate and compress the input signal, adding pleasing harmonics and thickening up the sound to bring out gloriously musical punch and body that wasn’t there in the first place. It’s one of those quasi-magical ‘plug in and go’ units, never failing to make electric bass sound more present, weighty and coherent, and similarly improving other instruments, too. The plugin is the same, but made much more interesting by the Bass and Headroom controls. While REDDI isn’t designed to be a creative distortion effect per se, we got some very tasty results indeed, smashing synth basses and electronic kick drums into the ceiling. Very few developers could turn something as seemingly humble and uninspiring as a DI box into an essential plugin, but that’s exactly what Kush has done with REDDI. It’s astonishing, and every producer needs it.